Can you guess which built-in Matlab function is the top search-term on UndocumentedMatlab.com and yet one of the least discussed topic on the CSSM forum? The answer is uitree – Matlab’s built-in function for displaying data in a hierarchical (tree) GUI component. uitree has been included in all Matlab 7 releases, but has never been officially supported. Like most other uitools in the %matlabroot%/toolbox/matlab/uitools/ folder, uitree and its companion uitreenode are semi-documented, meaning that they have no support or doc-page, but do have readable help sections within their m-files. In our case, edit the uitree.m and uitreenode.m files to see their help section. Like most other uitools (e.g. uitable and uitab), uitree is based on an underlying Java component, which ultimately extends Swing’s standard JTree. uitree sets up a scrollable JTree on-screen without the hassle of setting up a scrollable viewport and other similar nuts and bolts. In fact, you don’t need to know any Java to use uitree (although knowing JTree can greatly help you customize it) – uitrees can be manipulated using pure Matlab code, as shall be seen below. uitree returns two arguments: a handle to the created tree (a Java object wrapped within a Matlab handle) and an entirely-undocumented second optional argument holding a handle to the Matlab GUI container of the created tree. These two arguments are exactly the two arguments returned from the javacomponent function that I described last week. uitree automatically understands Root objects of type Handle Graphics, Simulink model or char string (interpreted as a file-system folder name). Other Root types require setting dedicated ExpandFcn, SelectionChangeFcn Matlab callbacks (see uitree‘s help section or below for examples). uitreenode accepts 4 arguments: a string or handle value (the node’s “internal” value), a string description (shown next to the node’s icon), an icon filename ( will result in an icon assigned based on the node value), and a flag indicating whether the node is a leaf (no children) or not. uitreenode returns a node object, which is little more than a Matlab handle wrapper for a Java Swing DefaultMutableTreeNode. Nodes can be added, moved or removed by node methods: node.add(anotherNode) adds anotherNode to the end of this node’s children list (possibly detaching it from its previous parent); node.insert(anotherNode,index) does the same but inserts anotherNode at a specific child index, rather than at the end; node.clone() makes a duplicate of this node that can then be added to another node; node.remove(index) and node.remove(node) remove a specific node whereas node.removeFromParent() removes this node; node.removeAllChildren() removes all children, if any, of this node. Nodes can also be added and removed at the tree level: mtree.add(parent,nodes) allows adding a list of nodes to a parent node and mtree.remove(nodes) removes the specified nodes. In order to programmatically collapse and expand nodes, use mtree.collapse(node) and mtree.expand(node). Next week’s article will show how uitrees can be customized. There are numerous possible customizations, including icons, labels, appearance, and behavior. So if you have any special request, please post a comment below. I’m trying to make a tree to store links to interesting m-files. So I’d like to learn a bit more about using Uitree. I have problems adding nodes in the tree : I don’t get my tree refreshed without restarting my gui. %% Executes when figure is resized. Yair will correct me if I’m wrong but I think some of your problem might be related to the fact the ML tree is set up for lazy loading. The leafs aren’t actually created until you expand. So if you want a leaf to show up on a refresh (rather than a user actually clicking on it) you’ll actually have to expand to its location programmatically (I know there’s an .expandrow method but there are probably other ways to). For Luc : maybe this is too late or you figure it out, but to refresh the display after altering nodes, you should use the reloadNode() method on the parent node. Any idea on how to enable Drag and Drop on older versions of uitree? In Matlab 7.0.4 (Windows), uitree.m mentions a “DndEnabled” but it appears to have no affect. However, with ML 2007a DnD appears to be enabled by default. What would be really useful is to have DnD available across a figure and or between panels but I’d imagine that’s pretty complicated. Below are some generic solutions that I have taken out of some code I developed to simulate drag-and-drop between a JTree and a MATLAB figure using the WindowButtonMotion callback. You may need to shake the mouse to initiate the callback on faster PCs- but that becomes second nature surprisingly quickly. % This function requires a WindowButtonMotion event to be fired. % Clear WindowButtonMotionFcn to prevent new calls. % Have we been too slow anyway? Error. The “@GUIWindowButtonMotionFcn” in the code above should be “fcn” for a generic solution. GUIWindowButtonMotionFcn is just the standard callback in my particular application. Is there anyway to have the parent of a tree be a panel rather then a figure? I would like to say, I just discovered this blog, and am really blown away. I’m loving all the new stuff I’m learning. I’ve been trying to implement a GUI with three tabs. Each tab has a child panel and in one of the tabs I’ve tried to place a uitree. However, regardless of how I set the uitree’s parent value, it always seems to be the figure, and not the panel on the tab. As a result, the uitree is always displayed regardless of which tab is selected. I’ve included the code below. Is there something obvious I’m doing incorrectly? @Drew – thanks for the compliment. uitree is basically just a Java component, and Matlab’s implementation of uitab has a known bug that it does not hide Java or ActiveX objects when switching tabs. The link I just gave provides some leads to solving this issue; you can try modifying the m-files in the folders %matlabroot%/toolbox/matlab/@uitools/@uitabgroup and /@uitools/@uitab, or you can use an actual JTabbedPanel (or one of several other Tab implementations mentioned in my uitab article) rather than Matlab’s built-in uitab. I have a question regarding tree creation. Typically, I would use node.setSelectedNodes() to mark a parent and then create a new child node below using treeModel.insertNodeInto(). The problem I am having is that Matlab seems not to wait for the setSelectedNodes-command to be finished before resuming its own code, and therefore, the order of the nodes gets mixed up (some times). My first and rather unsatisfying solution to the problem was to use pause() after each selection, making the tree build up very slowly. Is there any way to determine how long the java element exactly needs to finish the setSelectedNodes-command? Or is this error maybe due to the old Matlab version I am using, 2006a? @Tony – You do not need to select the parent node. As I said in the main article above, nodes can be added directly: node.add(anotherNode) adds anotherNode to the end of node‘s children list (possibly detaching it from its previous parent); node.insert(anotherNode,index) does the same but inserts anotherNode at a specific child index, rather than at the end of the children list. I have created a tree inside a GUI, I do this in the figure create function. So the tree will be available to all the widgets, I put the tree into handles (handles.mtree=tree;). When I leave the create function a get(handles.mtree) returns a tree. But when I try to access it from other widgets, the command get(handles.mtree) returns the container that was created in the in my call to uitree. How do I get back to the actual tree? @Teresa – I’m not exactly sure what you mean, but if I guess correctly, you may be missing a call to guidata(hObject,handles); after you modify the handles struct with the uitree handle. If you don’t use guidata(), then the handles struct is not updated outside the function. Thanks for your answer. I found another way to get back to the tree. But now I have another question. I am trying to store information into the node of the tree to be accessed later in my processing. 4) selecting that node and trying to get the data back. % NOTE: The new node is a "javahandle.com.mathworks.hg.peer.UITreeNode"
% whereas newNode.java is a "com.mathworks.hg.peer.UITreeNode:abc"
% 3) selecting that node and trying to get the data back. My question is how do I get back to the userdata in the javahandle.com.mathworks.hg.peer.UITreeNode object create earlier? @Teresa – Use the handle method ie: selNode.handle. This will return the javahandle.com.mathworks.hg.peer.UITreeNode you need. So for your example selNode.handle.UserData will return your struct. handle and java are complementary methods for converting to and from the javahandle package. besides to return the UserData, is it possible to change it? Writing gargantuan code to decimate and rebuild this list manually in a UITREE. Anybody know of a shortcut? Great post and discussion about “the tree”. Is there any way to make “Computer” or “Desktop” root, so the entire PC can be browsed? You could do it yourself, or use uigetfile instead. I’m having a lot of problems with uitree – specifically with the expand function. If I give the root node more than one child and It returns those two node’s in the roots expand handler, uitree chokes… This is topping off two days of frustration in using uitree. All this frustration has got me thinking… What’s the advantage to uitree over simply implementing a JTree? What’s the advantage to all these ML wrapped java objects? I’ve put JTree’s in my ML apps before with little or no problems whatsoever. What am I getting for all the uitree frustration? Simplicity? Ease of use? I’m not seeing it. @Joe – I tend to agree that if you know your way around Java’s JTree (or better still, JIDE’s JTree extensions) then you don’t gain much with uitree. However, keep in mind that many if not most Matlab users are not so comfortable using Java – a built-in Matlab wrapper would be something they would happily use, but not a Java JTree. Thanks for the reply Yair. I agree with you. I’m not a Java power coder but the online doc is very thorough. I can bump my way though. Java in ML is somewhat tedious although a lot less so now that I’m in ML 2010 and awtinvoke is no longer needed. If you write software for a living and have the time to learn, picking up Java is time well spent I think. I think I’ll go back to a JTree for now and maybe pick up uitree when it’s full grown. Thanks for all you Java support on this forum. I wouldn’t have gotten very far without it. I have problem using uitree and uicontrol together. I am using a tree and a edit box on a figure window. I am trying to read different data through edit boxes for each node. Edit box’s callback function is not getting called when I immediately click on the tree’s node after entering data in edit box. After entering data in edit box, If I click enter or click on any other uiobject or on figure, then the callback is invoked. Edit box Callback is not working if I click immediately on tree’s node. Can someone suggest me how to fix this problem? @Venkat – try to set your edit-box’s FocusLostCallback property, because the standard Matlab handles indeed do not update the edit-box’s value in such cases. You’ll need to gain access to the edit-box’s underlying Java handle for this, using the findjobj utility. I tested that using the below simple program that draws a a tree with one node, in the callback function I ask for the current figure using gcf, it creates a new one. Any clue why this happens ? @Johnson – gcf only returns the current figure if its HandleVisibility property is ‘on’. Otherwise, it skips this figure and if no other figure is open that has HandleVisibility=’on’, then gcf will simply create a new (empty) figure. @Mola – yes: you can use com.jidesoft.grid.TreeTable for this. JIDE components are discussed in several places in this blog and in section 5.7 of my Matlab-Java book, although TreeTable is not extensively covered in either of them. In fact, PropertyTable is a specialized class of TreeTable that only has two columns (the property name and its value), and this is extensively covered both in this blog and the book. If you want to use TreeTable, you will need to use the JIDE-grids programmer’s guide for more information. if possible I’d like to use drag & drop to move nodes from one tree to another. I partly suceeded using drag&drop within two trees with to code below. With the nodeDraggedCallback as is, any dragged node is simply added to the dropped-over node. This however stops working as soon as I try to drag a node from tree1 to tree2. The drop than results in matlab dropping the node that was last selected in tree2. Is there a callback or similar possibility to set the “drop-data” for a jtree manually? 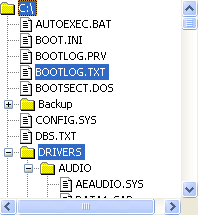 Is there a way to change the displayed name of the root object when using uitree with a file system folder without using uitreenode and having to create the expand functions. I basically want the automatic functionality created by the example below but I want a different Name displayed so the user does not see the entire folder path..? @CJ – you can point the root to a different path (e.g., ‘C:\Yair\’). More alternatives for controlling and customizing the uitree can be found in section 4.2 of my Matlab-Java programming book. I updated to Matlab 2013a and after that my tree will appear in a very, very small window. Is there any way I can affect the size of the uitree window? @Peke – you can set the uitree’s parent container’s Position property to any large position vector that you like. See the top of the article on this page. I would appreciate if you can tell me how to update size and the position of a uitree embedded in a guide GUI, when the guided GUI resize behavior is proportional. @Mohammad – update the mtree‘s Units and Position properties (example). First of all, awesome post, it’s been incredibly useful, and also thanks to everyone who’s posted such useful questions too! I have a quick one, is there any way of saving the created tree and its nodes in a *.mat file without loosing the javahandle properties? I’m storing all components in a structure for future callback, but when I save said structure it warns me that it can’t serialize the objects… what I’m trying to do is a ‘save/load project’ function and I’d like the user to be able to store everything in the tree and then load it back after closing the gui. Thanks beforehand for your valuable response! I faced a similar issue saving MATLAB figures containing Java Swing components. The problem is that the MAT-file format does not support serialisation of most Java objects, while the standard Java bean encoder does not support MATLAB. an XML file using java.bean.XMLEncoder for Java objects (a package like xstream could also be used). Java-containing property fields are set empty after saving. a MAT-file with properties containing MATLAB contents. As all Java objects are removed at step 1 – no exceptions get thrown. Reload by loading the MAT-file then setting the Java properties from the XML file. At least when nested fields are all MATLAB or all Java the two serialization steps should then be fairly automatic – xstream might save some work there compared to the bean encoder which needs persistence delegates to be added. An alternative might be to convert all fields to Java and save as XML- but then you need to save info about which to convert back. Thank you for your reply! I’d like to try that solution, while Mathworks decides to provide more support for this function… However I’m not completely familiar with encoding java objects, I hope I’m not being a pest if I ask you if you could be so kind of giving me a little example.. Your response is highly appreciated! as a “UITreeNode” is not accepted by “isExpanded” but a “TreePath”, and I am not able to convert it to it. Any ideas how I can solve the problem? @Domenico – I think that jPath = javax.swing.tree.TreePath(node.getPath) should return the TreePath object that you need. Great! That was the solution. Thank you very much Yair! I have a lazy loaded uitree, where the icon colors are dependent on the status of nodes downwards in the hierarchy. I’m working on a GUI which simply includes a graphical area and a tree. I’m using uisplitpane by Y.Altman and uipanel and uitab from undocumented matlab functions. The tree is generated within a tab. I get no error when running my script but I cannot see the tree correctly within the tab if I try to move panes or resize the figure. It seems it is independent from the panel which is its parent. I was wondering if there is a simple method to move a node up and down the tree (place it above its sibling for example) or change it’s parent such that it is one level higher or lower. First of all, thank you so much for this blog and your book. In the last few days they have been instrumental. I have been working with uitree and trying to incorporate it into my own version of Matlab’s “Find Files” tool. Uitree is amazing for grabbing a directory and displaying its contents. What I cannot seem to figure out for the life of me is how to get the selection the user makes in the uitree back into the GUI to allow for use as a variable in the rest of the function. I’ve tried setting up callback functions similar to the above and some other things I found on google. Do you have any recommendations as to how I could go about doing this? (My alternative is to rewrite the program from scratch and just not use uitree. But it would be so much cooler if I could get this to work.) Thanks so much for any advice/recommendations. @Carla – this is explained in the following articles of the uitree miniseries, as well as in my book (section 4.2). As everyone else has said, this website is a wonderful resource. I’ll be sure to check out your book too. Unfortunately, none of these work, and most of these methods aren’t found by Matlab. How can I expand an entire tree? Additionally, I’ve been having some difficulty with drag and dropping multiple nodes into another node. I can select multiple nodes and I can drag and drop a single node into another node, but when I select multiple nodes and try dropping them into another node, only one of them is added. The code I’m using is below and obviously getSourceNode() only gets a single source node. Is it possible to get multiple source nodes and add each of them? Actually, since yesterday I’ve been able to solve both of these problems, but in doing so I’ve introduced another. I now import javax.swing.tree. *; and create the treeModel and tree a little differently. Now when nodes have no children there is no unnecessary little expansion button next to them. Additionally, I realized I could simply loop through the selected nodes and move them one at a time. Unfortunately, the ‘add’ function doesn’t seem to be working as documented. I interpretted ‘targetNode.add(draggedNode)’ to effectively move draggedNode to become a child of targetNode. Instead, draggedNode is becoming a child of targetNode but the original draggedNode is remaining when it’s supposed to be removed from its previous parent. I’ve tried programatically selecting nodes and expanding nodes and reloading nodes, but none of these have fixed the problem. Below is the new callback function I’m using when a group of nodes is dragged and dropped. % --- Executes on drag and drop in tree. So… I’ve fixed the updating issue. The problem was that I was using reloadNode() on the dragged node when I should be using it on the (previous) parent node of the dragged node. Unfortunately, this has brought me back to the previous issue: whenever I drag and drop a new node, the rest of the tree’s nodes collapse. Is there a quick way to expand all of the tree nodes? No method 'expandAll' with matching signature found for class 'com.jidesoft.tree.TreeUtils'. where ctree is my uitree, but should I be doing something with this jtree? As I wrote above, expandAll() expects a jtree parameter, not a uitree (UITreePeer). Even if I try accessing the jtree that I create in my OpeningFcn through handles, I get an error. Can I convert the UITreePeer into a jtree just for the expandAll() command? % --- Executes just before ImageSearchDialog is made visible. I have the feeling, that I miss to call a function to update my tree. So my question is, what is missing to complete my code, that it works. @Daniel – you did not specify what exactly is wrong, but perhaps you are not calling your createUITree function from your main code. Anyway, if you’d like me to fix your specific program, I’d be happy to do it for a small consulting fee – send me an email and I will try to help. I’m delighted to find commands to create trees easily in MATLAB without using Java, many thanks Yair ! I’m designing a tree in a Matlab program, and I’m searching through the commands to find a node’s information. I’ve found commands such as getChildCount, getLevel, getName, getValue that return results (doubles or strings), but there’s one I’m struggling with, and I believe it would be very useful if I could get it to work, it’s getIndex. It returns nothing, could you help me please ? Thanks for the great work. i used it in several applications and it is working perfectly. Would anybody know how I can use a Fixed Width font in a uitreenode? I would like to know if there are any limitations with MATLAB Compiler. I think it should work but I just want to be sure. Hello, I want the root node to be a folder selected form the hard drive and to open its content (subfolders and files) in a tree, so I tried using uigetdir as an input argument for the uitreenode. It displays it on the figure as the root node but does not open the subfolders and files located in it. How can I be able to open the folder? Follow the code in the article to select and display the root note, and then simply double-click the root node to open its sub-folders. 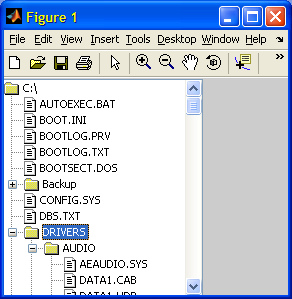 I am able to select the folder from the computer and it is set as the root folder. I click on the root and the files and subfolders open, however when I click on the subfolders they do not open and the plus on the side just disappears. Is there a way to open them recursively? Thank you.